The first project to be delivered by Clugston Construction under the University of Sunderland Major Capital Works Framework is heading towards completion in June. Clugston was appointed sole contractor for delivering projects over £1.5m. Working closely with the University, Identity Consult, GSS Architecture, FaulknerBrowns, Shed, Summers Inman and JH Partners the pipeline of projects are up and running to meet the University’s aspirations of providing first class facilities for students, on time and within the agreed budgets. The first project being the reconfiguration and refurbishment of the University’s Science Complex is being delivered in a number of phases, with the offices and administration facilities within Pasteur level 1 and the laboratories within Fleming level 1 already handed over. The programme is now focused on undertaking M&E services works refurbishments and alterations to the curtain walling and the formation of a new entrance to the existing four storey building. Once complete the facility will provide state-of-the-art laboratories, research facilities and a ‘living lab’ consisting of a hospital training ward, point of care centre, a high-fidelity simulation suite, examination rooms, a pharmacy, together with teaching hubs, training rooms, seminar rooms and staff offices. 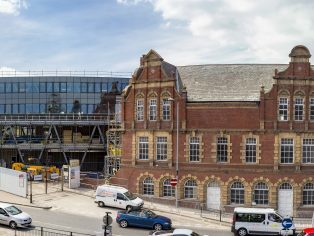 Being developed concurrently is the £7m Centre for Enterprise and Innovation, which sees a Grade II listed building being refurbished alongside the construction of a new modern extension. The new Centre, located alongside the University’s City Campus, will be part refurbishment of a Grade II listed building and part new build. It will provide modern laboratories, workshop and office space for new and existing businesses, in particular in the sectors of advanced manufacturing, health, sciences and the creative industries. In addition the new Centre will accommodate the University’s Enterprise Place, a business incubator for graduate and student businesses, as well as a large conferencing suite and plaza cafe. Once completed the University will be able to support three times as many businesses as it currently does, positioning it at the heart of the Sunderland Economic Masterplan. In line with the University’s programme of improvements Clugston and the team are also developing the design for remodelling to an existing parking area. The final layout will provide an entrance plaza outside the CEI building that is currently being constructed coupled with a pedestrian link to the main plaza situated between the Sciences complex and the Edinburgh Building. The scheme will also include new external lighting and CCTV improvements with works due to commence in June for completion late August.